Learn about Dr. Visconti's role at the Breast Health Center and how his interest in medicine developed. 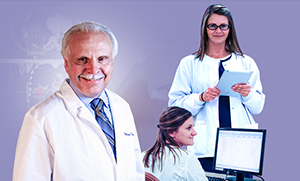 Meet Dr. John Visconti, a medical oncologist. When do you first recall wanting to become a doctor? That went back to high school, when he was very interested in science and working with his hands in the lab. He thought about extending that interest into a potential career down the line. Plus, he liked his pediatrician growing up. What is your role at the Breast Health Center? Dr. Visconti is a medical oncologist, and his role in treating patients with breast cancer is medical therapy either before or after surgery. He guides them through the therapy. What is something people may not know about you? He is an amateur bird watcher, which is something he got hooked on after field trips in college. A number of treatment options are available for breast cancer patients. Your surgeon, radiation therapist, or oncologist will help choose what's right for you. 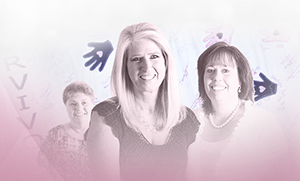 Some Breast Health Center of Excellence patients shared their stories with us.